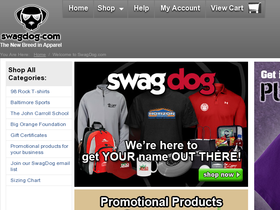 SwagDog.com is a whole new breed of apparel. SwagDog.com offers a vast array of unique apparel, custom t-shirts, designed tees, and other goods by some of the biggest names in the industry. Bring out your inner nerd with World of Warcraft shirts, or be ironic with some inappropriate beer shirts. SwagDog will also let you go retro with comic book shirts, or save you from small talk with funny shirts. Bring out your inner SwagDog today. Visit 58Coupons to save with discounts, coupons and promotions for SwagDog. Save 25% on your order from SwagDog.com when you use this code at checkout. Click link and start shopping. Get low flat rate shipping from SwagDog on any order. Click link to shop and pay only $4.99 for shipping. Select shirts on sale at SwagDog are now discounted by 75%. Click link to save. Shop for T-Shirts at SwagDog for as low as $19.99. Click link.